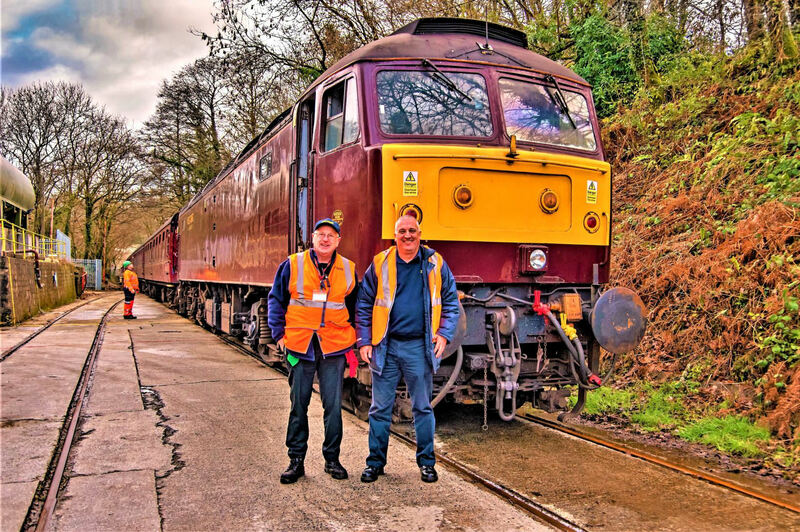 The aptly named 'The Looe Brush' railtour was the second of two trips to the South West. No prizes for guessing the top prize on the raffle. It was indeed a new - not second hand - loo brush (with various goodies) and the winner was absolutely delighted with his prizes! 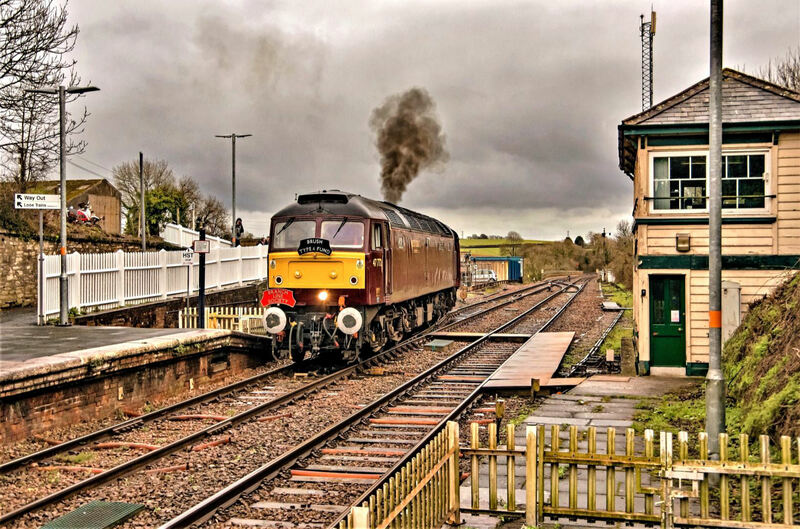 The trip the day before (BLN 1325.764), also with an apt name 'The Positioning Move', ran from Lancaster to Bristol using the stock as a railtour instead of just an ECS run. 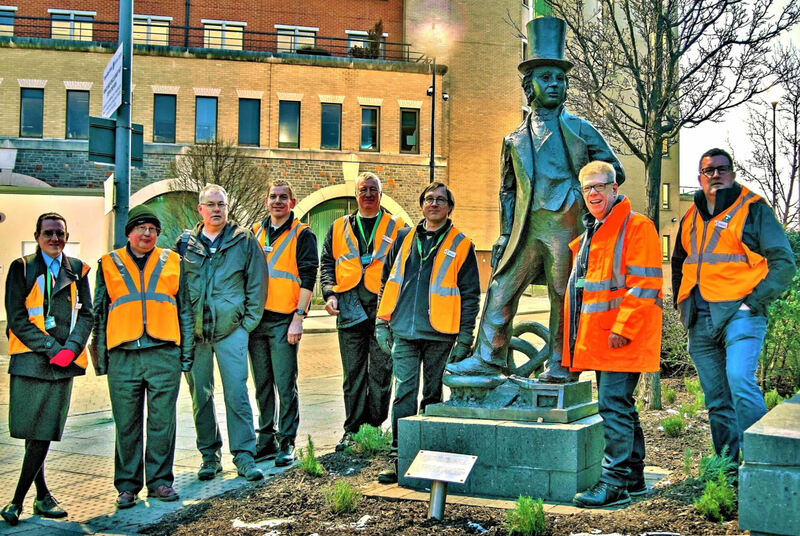 An early morning 'selection' (collective noun) of seven Stewards on their way to Bristol TM were keen to be photographed with The Great Man himself so Kev Adlam duly obliged. 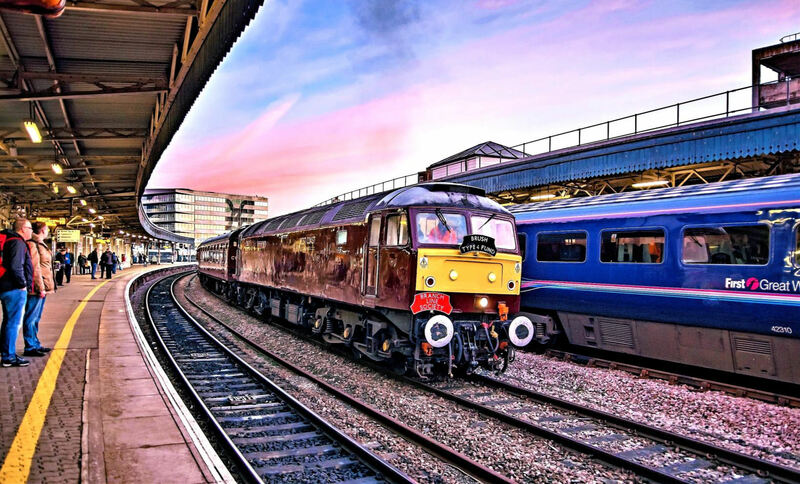 Our Sunday 3 Feb 2019 Looe Brush railtour on the Down Through at Bristol Temple Meads. View of the south end of Bristol TM with snow and sun, seen from the loco cab. On a beautifully clear but crisp (-4oC) winter day I joined the tour at Taunton with a good number of other participants. On Thursday the West Country had experienced its worst winter weather in a number of years with 20cm snowfall which resulted in traffic chaos and road closures. Fortunately the cold snap was short lived and the thaw began the following day, just in time for all those travelling/positioning for the tour! At Bristol Temple Meads a participant reported it had been -8/9oC at Shepton Mallet that morning and another had applied soap to the inside of the train window to raise the dew point and prevent condensation from spoiling the view - very unusually it promptly froze into a most attractive 'fern leaf' pattern although this had all cleared by Taunton. 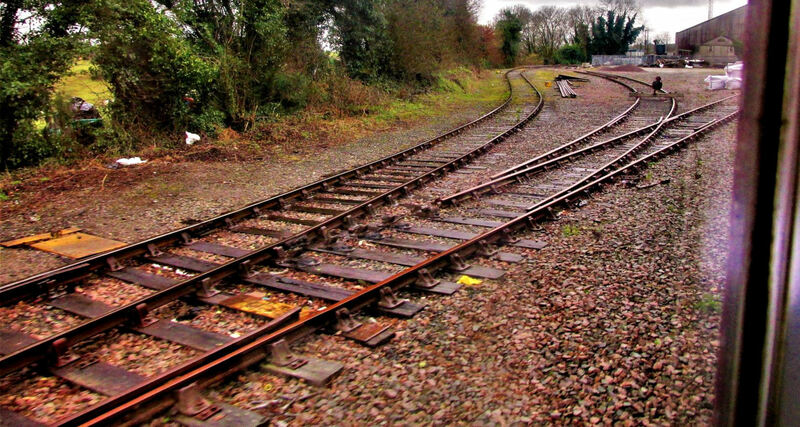 The only interesting track Taunton joiners missed on the outward leg was the Up Goods Loop south of Highbridge & Burnham-on-Sea in the Down direction (it is bidirectional) with its attendant facing then trailing crossovers. The tour left Taunton 4 minutes early at 09.01 with everyone on board. West Coast's 47772 was at the helm with 8 Mk1s and 47826 on the rear to assist with the reversals. We were then routed via the bidirectional Goods Reception line at Fairwater Yard where GBRf 66717 & 66719 were stabled. 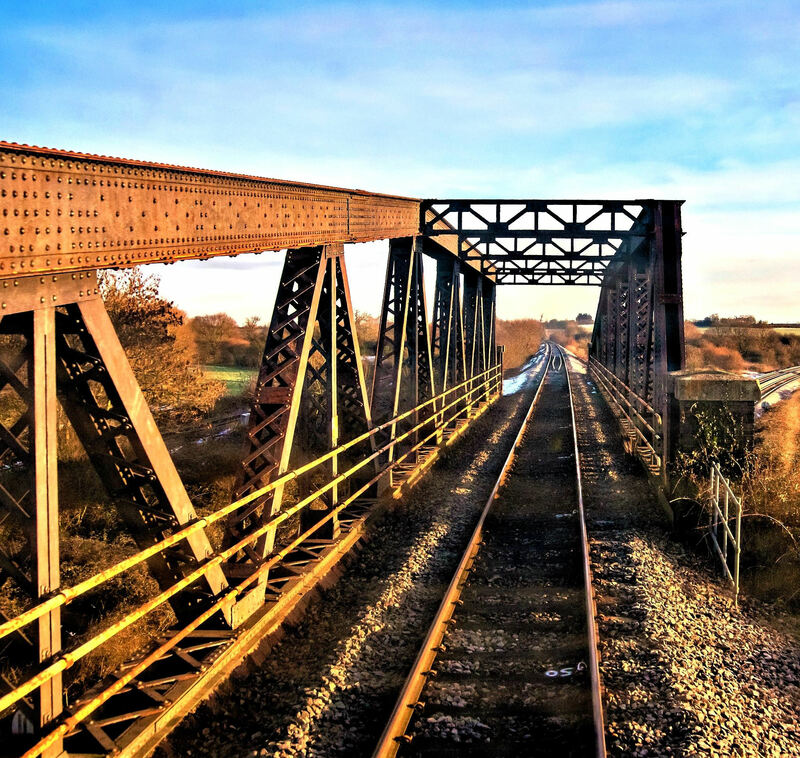 Taken when the train was stationary on a cant; a cold and frosty Devon morning. Approaching Cowley Bridge Jn, the Down Goods theatre light and elevated shunt signal are 'off'. Shortly after picking up what appeared to be a solitary passenger at Tiverton Parkway we took the Down Passenger Loop at the former Tiverton Junction station (CP 12 May 1986) for an on time southbound DMU to pass. A few minutes later we noted the new culverts, to reduce the risk of the railway flooding, then paused at Cowley Bridge Jn awaiting the signal for entry to the Exeter Riverside Down Goods/Departure/ Reception line (how's that for multitasking?). Despite all the recent heavy snowfall and following thaw, the River Exe appeared very calm. The view has changed here due to River Exe flood prevention works. Our tour then arrived into Exeter St Davids (P5) 16 minutes late. Perhaps the reason for our late arrival was that 70811 occupied P6, having arrived with 6C23 from Cowley Bridge Jn to Hinksey Yard. 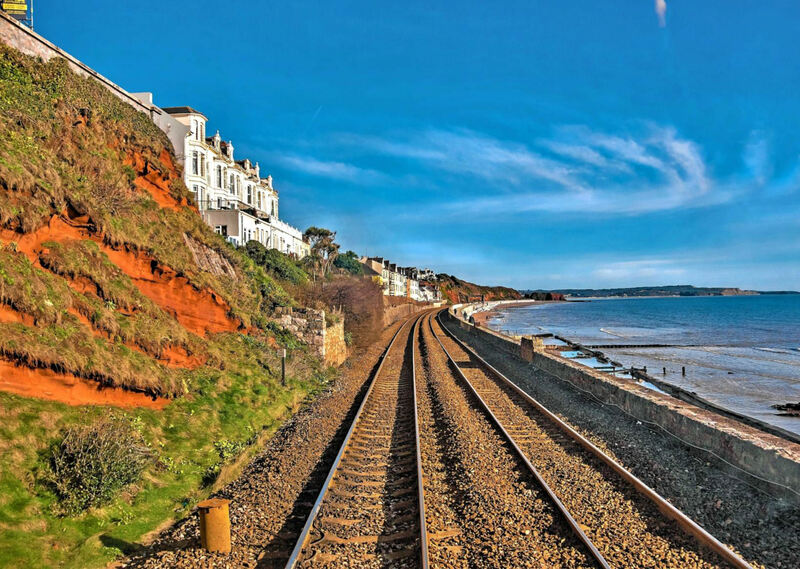 It was almost five years ago to the day since a huge storm washed away 90yd of the Dawlish coast section of railway. Incredibly, it reopened exactly two months later. If only the Government could act this quickly on reopening the much talked about, diversionary route via Okehampton and Tavistock! 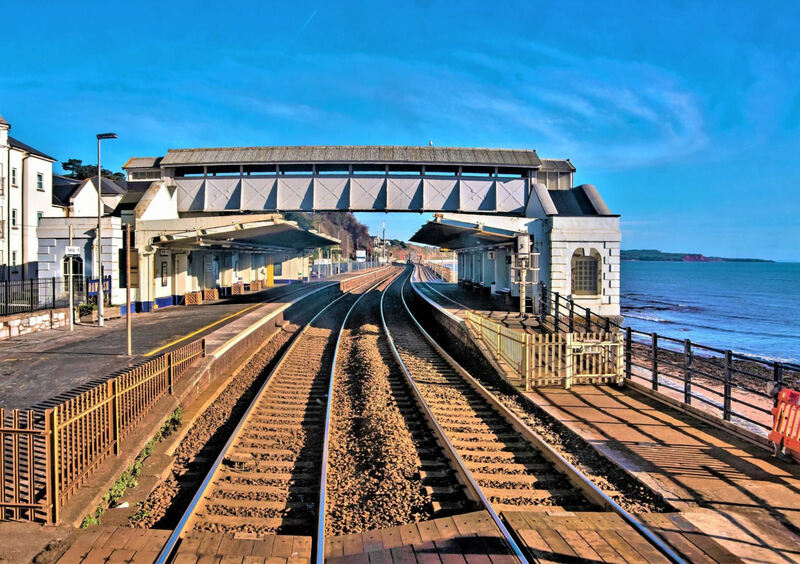 At Newton Abbot, in true BLS style, we were pathed through Up P3 in the Down direction which necessitated the use of Newton Abbot east facing crossover and the west end trailing crossover. With a brief stop at Totnes the South Devon banks provided a good workout for 47772, arriving into P4 at Plymouth 17 minutes behind schedule. A debate ensued on whether we took the first line (also accessing the Dock sidings) or the more usual second line. It was confirmed as the second line. 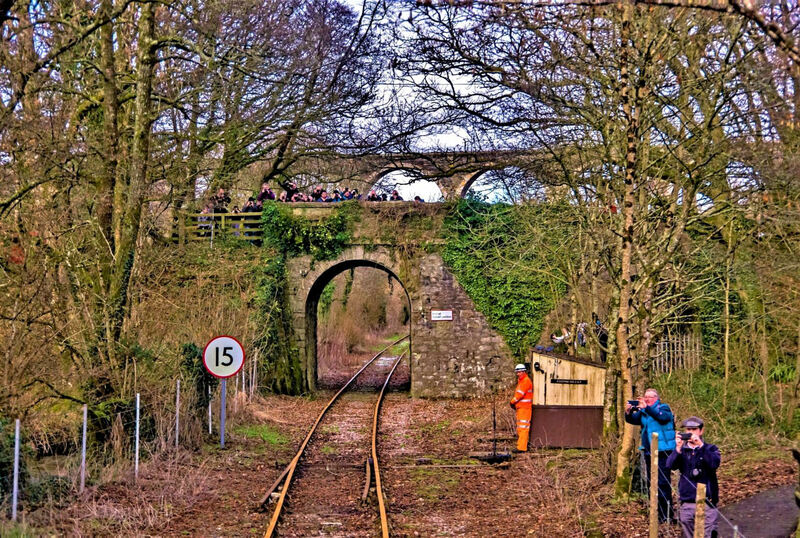 Now onto Cornwall and ultimately the highlight of the tour, the much sought after connecting line onto the Looe branch. Final approval from Network Rail was received just over a week before the tour ran. At this point the tour was already fully booked with a long waiting list, so those who held out awaiting confirmation missed out. On previous form, could be another 20 year wait for the next tour! Reaching Liskeard 21 minutes late we were greeted by an impressive crowd of people to witness this rare event. To make up some time it was decided we should head straight to Moorswater, omitting the reversal into bay P3. To gain access to the branch we needed to reverse at Signal 9 to take the Penzance end trailing crossover to reach Liskeard P2. 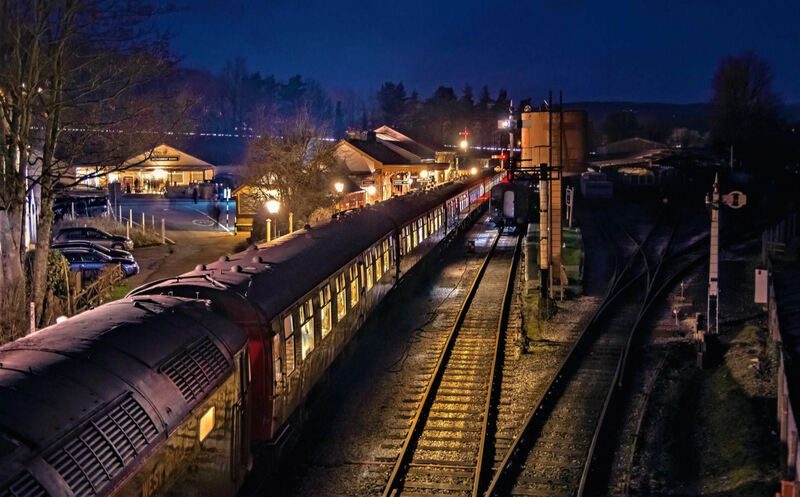 The stipulations for traversal of the connecting line were that the buffet and toilets must be closed and everyone remained seated with strictly no cameras or body parts out of the windows. With two stewards in each coach this was 100% observed. A dramatic hush descended on the train as participants couldn't quite believe what was happening. It took no longer than three minutes to crawl along the right hand line (TRACKmaps Book 3 p10A - Jun 2018). The left line of the loop is severed at the Looe end. Flushed with success after finally doing the connection, the mood on board was jubilant, a bottle of Champagne was even shared (in First Class). The line to Coombe Jn is interesting to say the least. 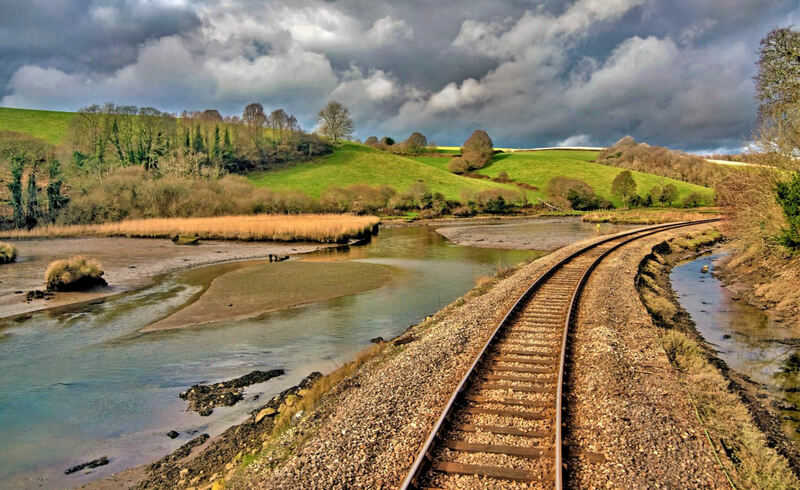 It is steeply graded, descending and curves 270o clockwise from the direction of travel on the mainline so the Looe Brush went round the U-bend. We paused at Coombe Jn No1 Ground Frame then ran through Coombe Junction Halt, under the mainline for a second time passing Moorswater platform (CP 15 May 1901) on the right. At Tarmac Moorswater it splits into two, we took the right hand line beyond the NR limit. The former China Clay terminal now receives weekly trains of cement from Aberthaw Cement Works. Over the level crossing, we traversed the left hand line as far as freight locos do. This tour is believed to have gone further than any previous mainline one. Thanks to our GS, Tim Wallis, for his patient and complex protracted negotiations. We retraced our tracks to Coombe Jn and then ran down the very scenic Looe branch arriving on time, more or less. 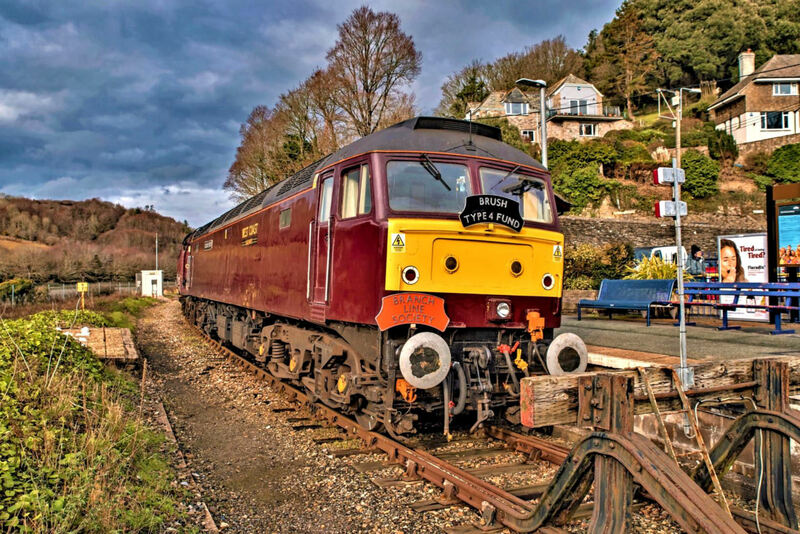 Despite only the front two carriages (and the Class 47 - a most unusual sight at Looe) being platformed, the train with 321 participants on board emptied with remarkable efficiency and we then had time off in Looe, an hour to take advantage of the local chippies, bakeries and pubs. Within the hour every single Cornish pasty in Looe had been sold and nearly all of the fish and chips! Some participants went to a local sandwich shop to sample the world famous Looe rolls (not on BOGOF). With everyone fed and watered, the train returned to Liskeard this time in to bay P3. Participants (at least those who are unidirectional) had the choice of alighting to take photos and make videos of the manoeuvre back to P2 via the connecting line where they could rejoin. 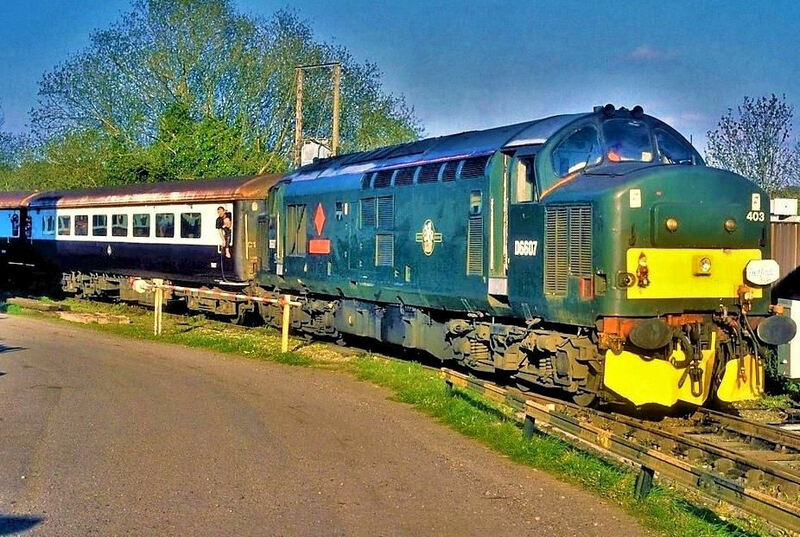 Quite a few did, as the rare connection was done again, and Kev Adlam's off-train video is available on our Facebook pages. After the reversal in Liskeard P2 we headed back towards Plymouth where there was the option of another break of just over an hour. 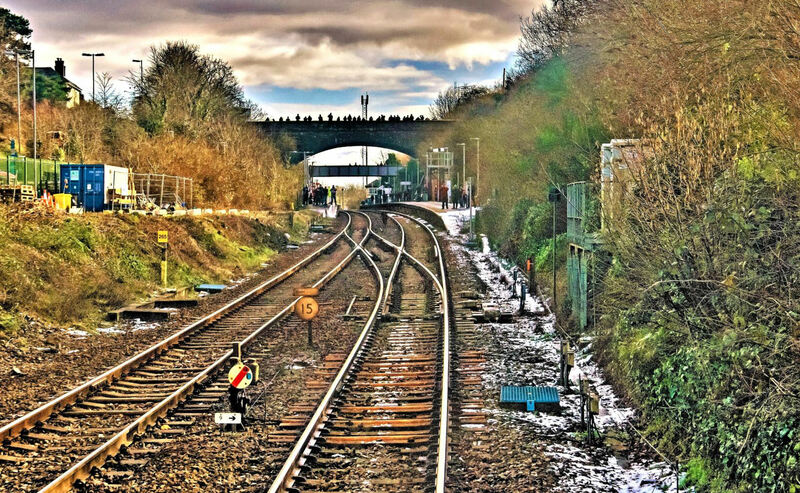 Shortly before arrival, Kev announced that the train would be turned via the triangle at Laira, due to a Train protection & Warning System (TPWS) aerial fault in the front loco and permission had been obtained for passengers to remain aboard. Most did so and while this took place a loose change charity collection was made in recognition of the extra track, participants being particularly generous (thank you). We turned right at Lipson Jn to the bidirectional Down/Up Plymouth Loop No1, reversing after Friary Jn before proceeding on the Up line to Speedway Jn (paradoxically after which there is a 10mph restriction on the Down/Up Goods past Laira Depot!). At Laira Jn our tour reversed on the Down Goods line and then returned to Plymouth station. We left Plymouth on time, noting at Hemerdon that the Up Goods Loop was shiny. 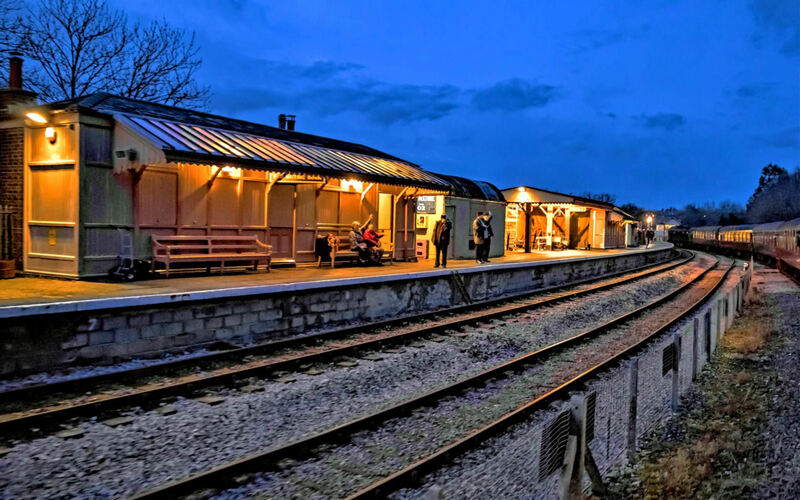 We descended Rattery Bank and entered Totnes for a run to Buckfastleigh (returning in the dark) covering another rarely used strategic connection, to the South Devon Railway. 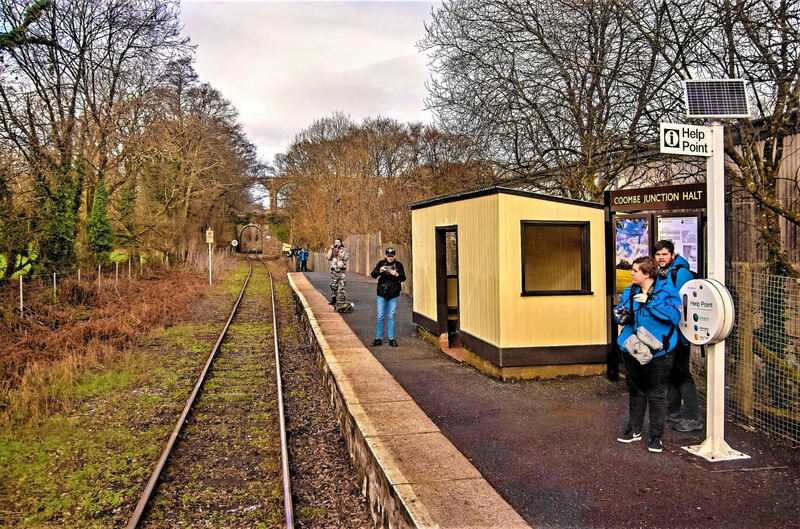 The 25 min Buckfastleigh break was just enough time for some to buy food or drink from the café just outside of the station. Six of our eight coaches fitted in the platform which doesn't see many, if any, Class 47 locos, let alone two at once! After reversal at Totnes we tackled Dainton Bank before descending into Newton Abbot via P1 this time via the west end facing and east end trailing crossovers, completing five of the six at the station. 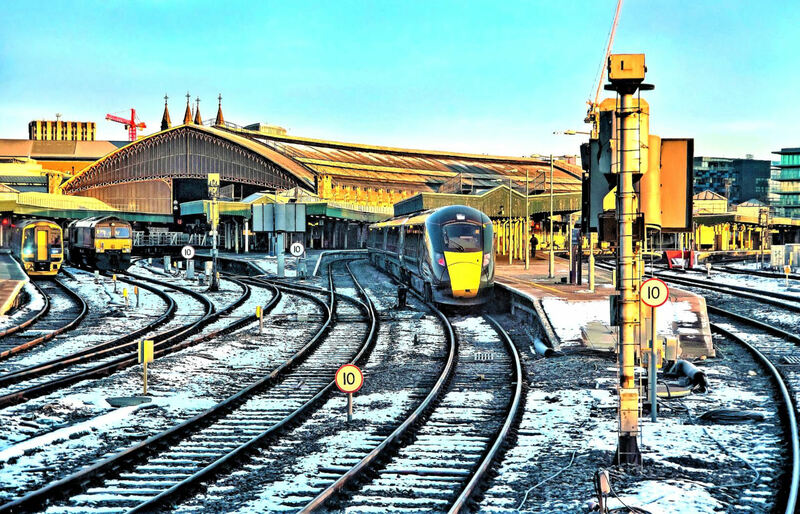 Exeter St Davids P6 was reached on time and some left for trains back to London. I left the tour at Taunton, missing out the final highlight of Heywood Road Jn trailing crossover when the tour reversed. This was yet another superb tour organised by the Society. We managed to cover an incredible amount of interesting track and the highlight for many would have been the strategic connection at Liskeard onto the Looe branch (thanks Kev and all concerned for your considerable efforts on this; very much appreciated) and no doubt the trip into Tarmac Moorswater (ta Tim Wallis and Tarmac). Many thanks to all involved to make this enjoyable trip, mostly in bright sunshine, possible including West Coast, NR, Gravy Train Catering, the BLS team and not forgetting the real ale trolley! 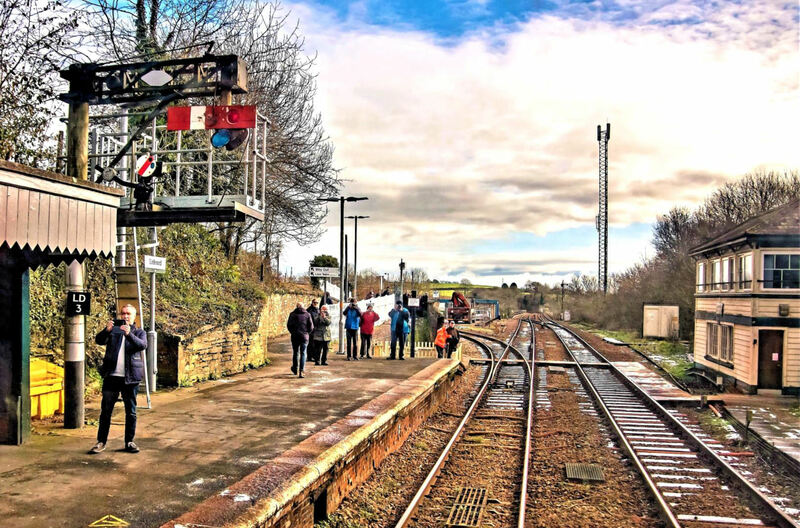 Incredibly the raffle broke the Society record exceeding £2k and over £10k was donated to the Railway Benefit Fund and St John's Hospice, Lancaster (including contributions from the fares etc). Additional donations were made to local charities nominated by Tarmac, Moorswater. 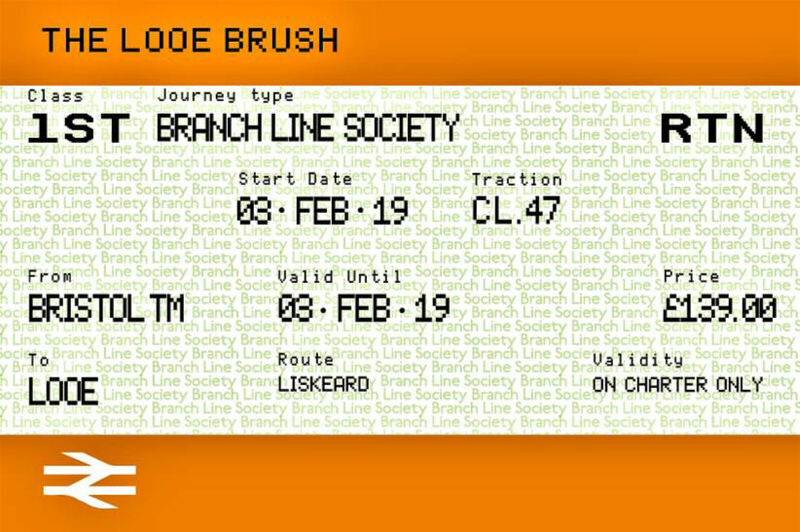 A tour of this nature is unlikely to be repeated again soon but perhaps a future rerun could be named ' The Looe Brush Returns - The No2'? 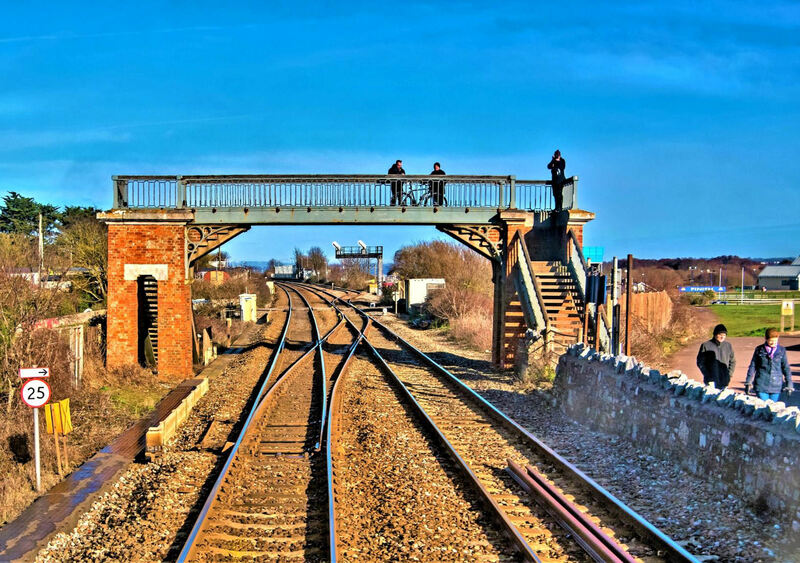 The Down Bristol flyover line at Cogload Jn (Taunton), with the Caste Cary line beneath. Dawlish Warren and its Down passenger Loop is in the distance and not a rabbit in sight. The tour took the facing crossover and is on the Bidirectional Up Main in the Down direction. On the famous sea wall at Dawlish, the repaired section is on the curve in the distance. 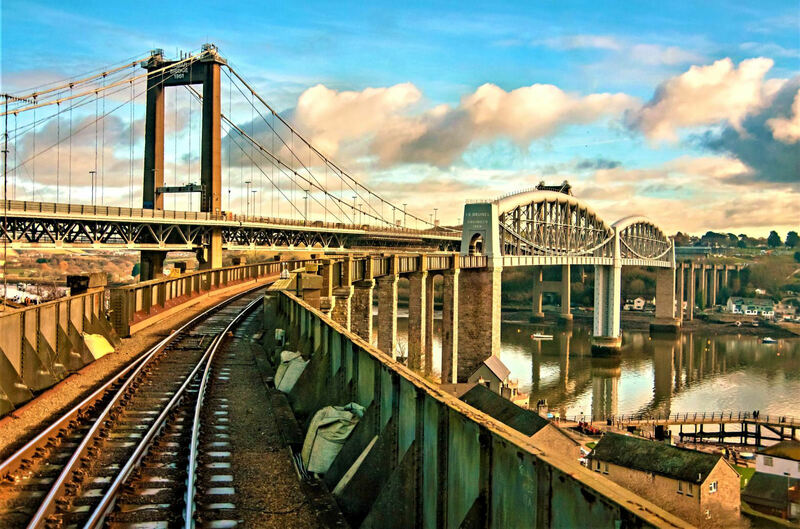 After crossing the Royal Albert Bridge above the river Tamar and running into Cornwall. 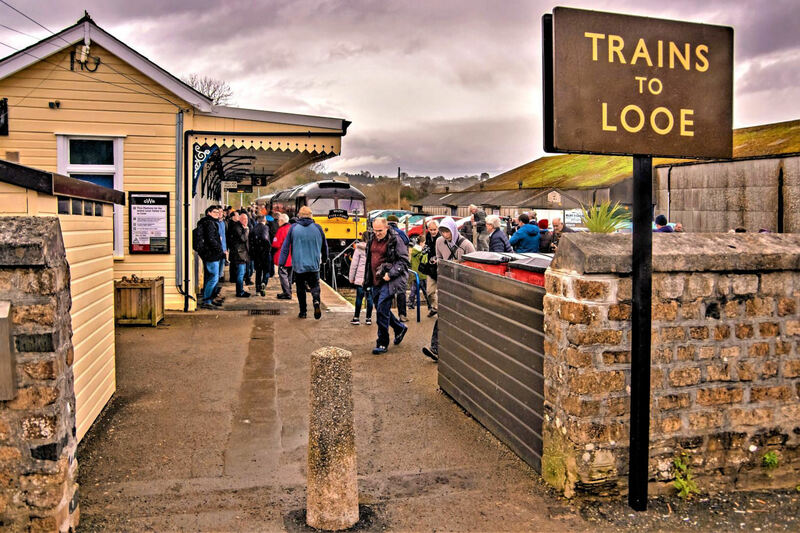 The crowds are massing at Liskeard for the rare event as the train reverses at the west end of the station. Signal No9, the ground signal, shows a 'proceed' aspect to take the trailing crossover over to P2. 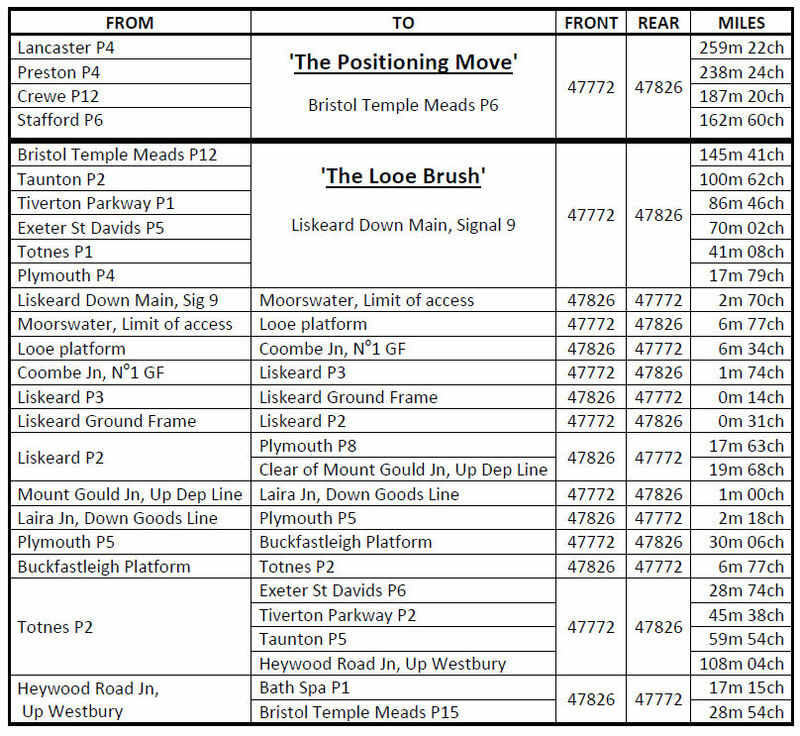 Mile Post 265 is on the left (miles are from London Paddington via Box and Plymouth Milbay). After passing through Up P1 the tour is about to take a left onto the connection. 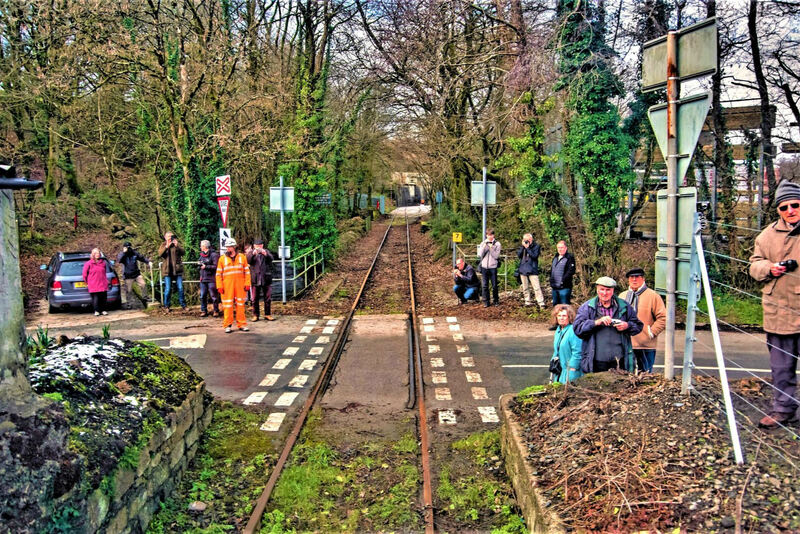 On the connection to the Looe branch, the rust is misleading it was used the evening before. Coombe No2 Ground Frame with the GW main line west of Liskeard on the high viaduct. 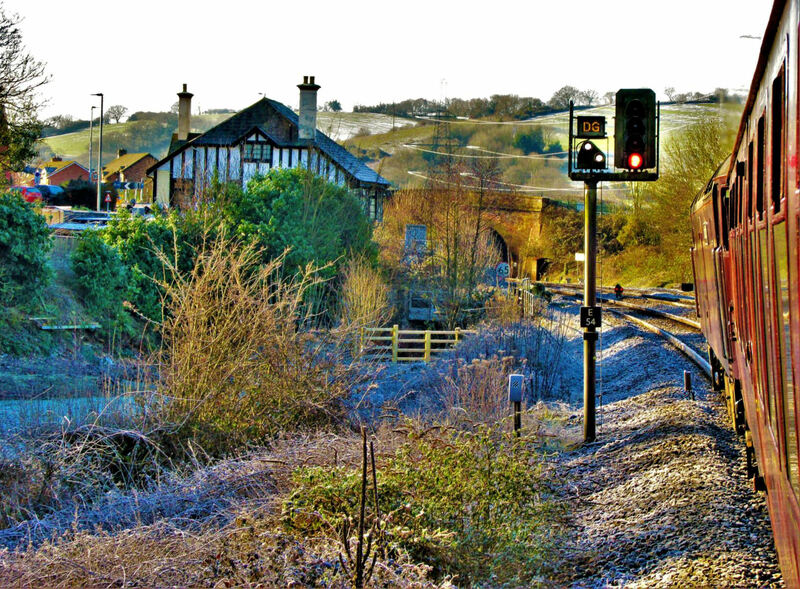 Moorswater Crossing; then MP7¼ on the right and, appropriately, the 'terminal' gates at the end. Train crew and front of the train at Moorswater Cement Terminal (taken by authorised staff). Approaching Looe, this is the section of the branch that floods periodically closing the line. The 'Looe Brush' finally brushes up against Looe platform. 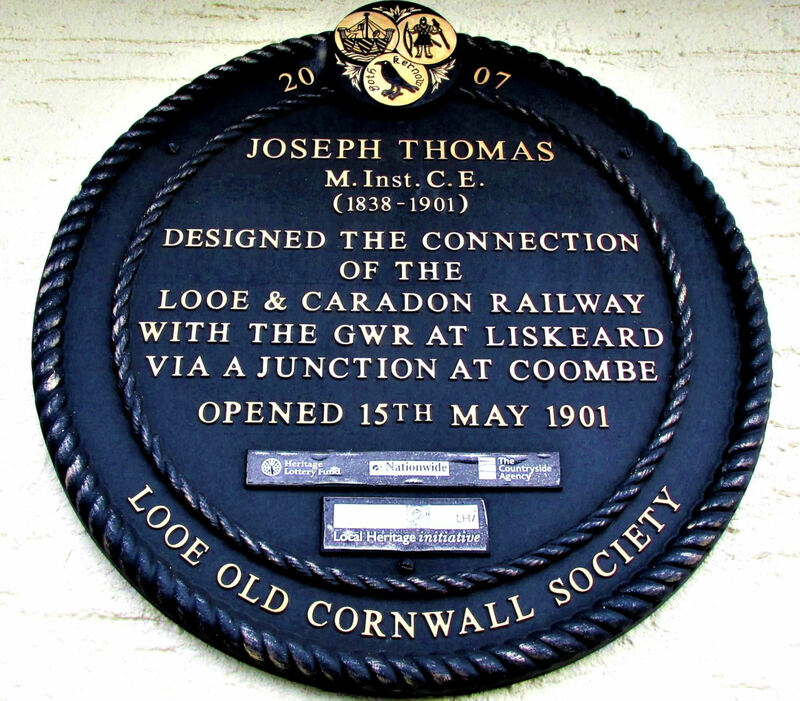 Plaque at Looe station. Now we know who to thank/blame for the weird Liskeard connection. Moorswater station also closed to passengers from 15 May 1901. 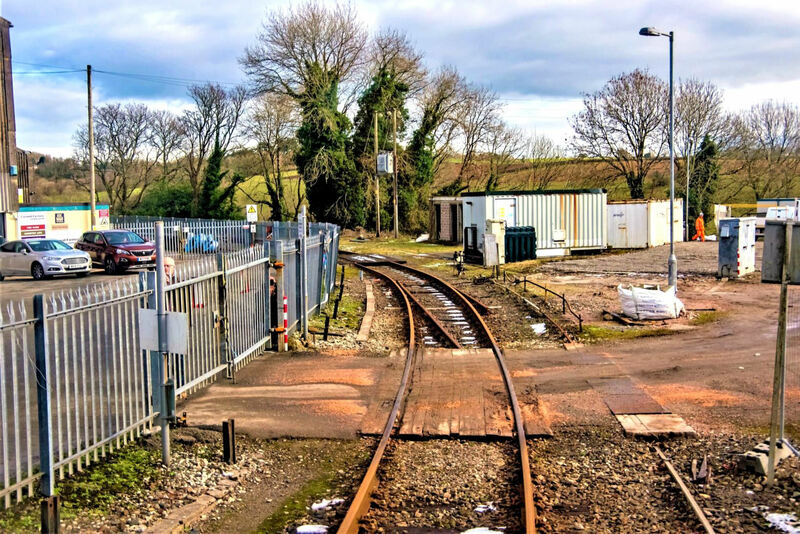 OOU track, the former loop on the connecting line and ex-Cornwall Farmers' terminal siding (off right) taken from inside the train arriving at Liskeard bay P3. Well, actually it's a train from Looe! Our tour in Liskeard bay P3. 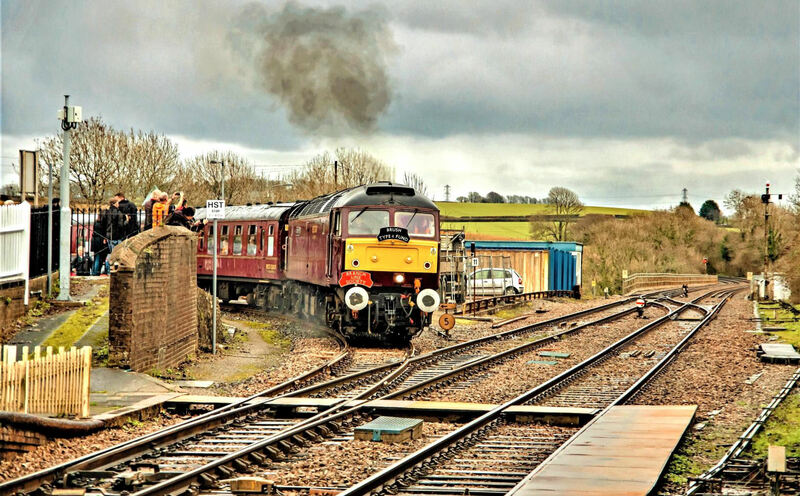 The Looe Brush comes off the connection at Liskeard (taken from Liskeard P1). Heads up on the previous train to do the connection carrying passengers (3 May 1998). The east end of Liskeard station as our tour enters P1. Taking the little used connection onto the South Devon Railway at Totness Riverside. From our 3 Feb Looe Brush tour looking towards Exeter.